Learning about Torchy’s secret menu is like being handed the key to a city made of candy. It feels like dancing through streets made of spicy breakfast meats with rivers of poblano cream sauce. In other words, it is exciting. These tacos are outrageously over-the-top. In my pre-secret-menu innocence, my favorite taco was the green chile pork. Essentially shredded pork in a corn tortilla. The secret menu version, Missionary-style green chile pork, adds pickled red onions, guacamole, jack cheese, and chipotle sauce, and then the whole thing is deep fried so the corn tortilla gets beautifully crisp, and then that’s wrapped in a flour tortilla so your hands don’t get greasy. It’s deliciously clever. 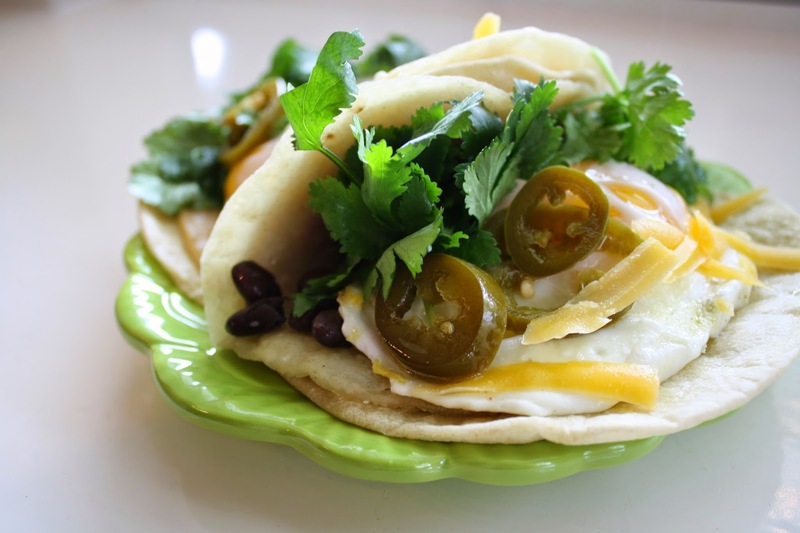 Another taco, the Jack of Clubs, is easier to recreate at home and just as delicious. It’s black beans, potatoes, a fried egg, tortilla strips, jack cheese, sour cream, and cilantro. I am so enamored with the missionary-style technique of combining a fried corn tortilla with a soft flour one that I added that technique to this taco, in lieu of the crunchy tortilla strips on the Torchy’s version. I omitted the potatoes (which almost seemed mashed in the Torchy’s taco and were quite tasty) because the taco was a lot easier to make without them, but you should add them if you’ve got the time. I made this the taco in my friend Abbie’s kitchen, with a group of fellow food52ers. We call ourselves Ginger’s Kitchen (after Abbie’s sweet pup) and bounce ideas off of each other and come up with collaborative recipes. Here are the two we developed that morning for that week’s food52 contest, Your Best Weekday Breakfast. None of our recipes were selected as possible finalists, but I can assure you they were all quite tasty! 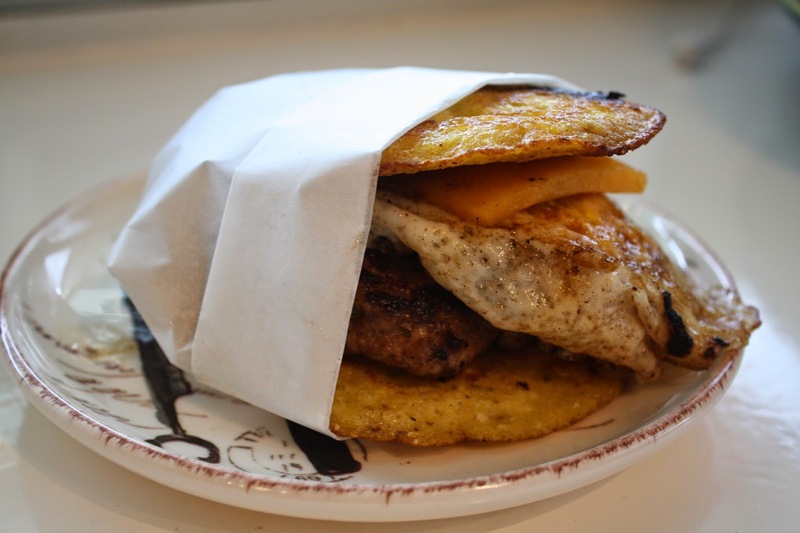 Our homemade spin on a McDonald’s McGriddle, replacing the pancakes with johnny cakes (cornmeal pancakes) and the sausage with a Mexican chorizo patty. There’s maple sugar in the pancake batter, but you could go the extra step of making your own maple sugar crystals, which will then melt into delicious pockets of syrup in your finished pancake a la this recipe– it’s easier than it sounds and so good! A grilled “cheese” sandwich featuring cream cheese, almond butter, dark chocolate, and strawberries. 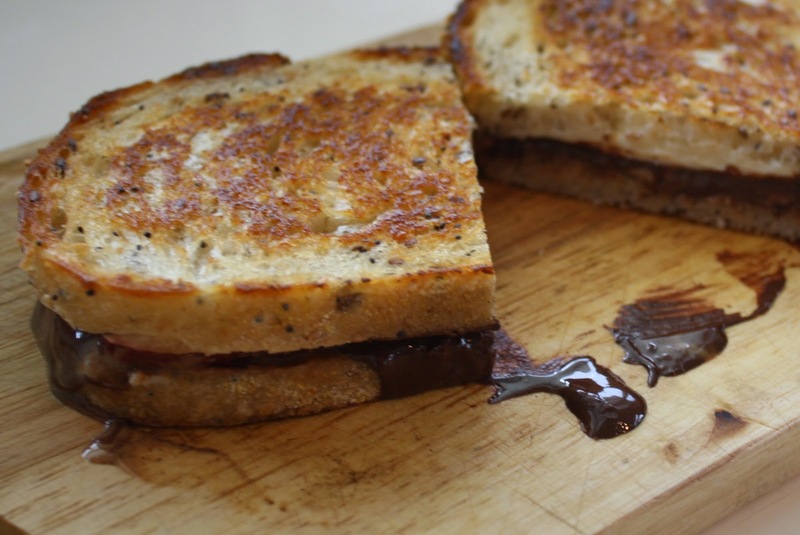 I can assure you that you won’t be disappointed if you put chocolate on bread and grill it in butter. The rest of the ingredients are definitely gilding the lily, but we devoured it all the same! When the tortillas are done, put the black beans and a splash of their cooking liquid into the dry pan where you toasted the flour tortillas and heat them gently and season to taste. Melt the tablespoon of butter in the pan where you fried the corn tortillas (leaving the remaining oil in the pan) and crack in two eggs. Cover this pan with a lid and cook until the whites are set and the yolks are still runny, about 2-4 minutes (check them often!). You might need to spoon some of the fat in the pan over the top of the whites to finish them off. Assemble the tacos by spooning some of the black beans onto the tortillas and top with a sprinkling of cheddar. Put the fried egg on next and season with salt and pepper. Put a good handful of cilantro on next and squeeze some lime juice over it, and then add 3-4 pickled jalapeno slices. Enjoy! This is the same basic formula I use for any kind of bean (pinto, cannelini, garbanzo) and it works beautifully with all of them. I don’t always include the bacon strip but it adds a wonderful hint of smokiness. Put the soaked beans in a large dutch oven and cover with two inches of cold water. Add the bay leaves, garlic, and bacon slice, and then season the water with plenty of kosher salt (as much salt as you would use for pasta water- several tablespoons). Bring the pot to a boil over high heat and then lower the heat to low, cover, and simmer until the beans are done, 1-2 hours. (I prefer to transfer the covered pot of beans to a 300 degree oven after they’ve come to a boil because that keeps it at a very even and gentle simmer without having to constantly monitor and regulate your stove’s burner.) Test your beans at the one hour mark by eating a few- they should be soft and creamy. If not using all the beans right away, transfer them to mason jars and cover with their cooking liquid. You can freeze them like that too. Thanks mama! I've been obsessed with pickled jalapeños lately. Went my whole life not eating them and I'm suddenly putting them in everything!